Filed to: any questions?Filed to: any questions? Tom Hanks is (hopefully) returning to Saturday Night Live as David S. Pumpkins, the Halloween elevator haunt who shimmied his way into our hearts. But if former SNL star and sketch co-writer Bobby Moynihan is to be believed, Hanks originally wanted nothing to do with the character. During an appearance on Late Night With Seth Meyers, Moynihan shared some details about how the David S. Pumpkins sketch came to life, including how they were trying to make the “Santa Claus of Halloween.” However, during rehearsals, Hanks apparently tried to pass on the sketch, saying that he didn’t really understand it. Apparently he’s very happy with the character now, and why wouldn’t he be? The sketch became one of the most popular moments of last season, garnering over eight million views on YouTube alone, and people have been cosplaying as the character at comic cons. 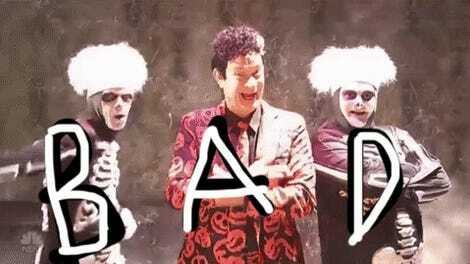 Hanks later cameoed as David S. Pumpkins in May’s “Rap Song” sketch, and he recently shared what looks to be a page from an upcoming sketch dedicated to the Pumpkin King. Bony fingers crossed! You can check out the whole Moynihan interview below.